Of course, that was even before Joe joined Eagles and made indelible contributions to the great American pop culture canon on such songs as “Hotel California” and “Life in the Fast Lane,” and, more recently, became an honorary member of the Foo Fighters. 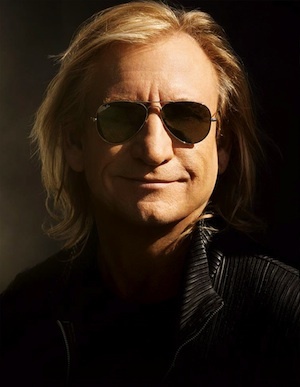 Joe Fidler Walsh was born in Wichita, Kansas, on November 20, 1947. His mother was an avid piano player who brought music into the family’s humble home before Joe was old enough to discover rock n’ roll on the radio. When Joe was still young, he and his family moved to Ohio, Chicago, New York City, and then Montclair, New Jersey. In 1965 Joe landed back in Ohio when he attended Kent State University, where his professional music career began in coffee shops and bars. Though Joe had played guitar in a high school cover band and a popular Kent bar band while in college, he really came into his own in 1968, when he joined the Cleveland-based James Gang. One night in May, 1968, on the way to Detroit for a show at the Grande Ballroom opening for Cream, half the band quit. Needing the money to pay for gas to get home, the James Gang took the stage as a trio, and Joe was forced to learn on the fly how to carry rhythm and lead duties while now singing lead simultaneously. It proved a revelation. Permanently reconfigured as a trio, the James Gang quickly developed a huge following in the Midwest and landed a record deal, leading to a 1969 debut album, Yer’ Album, that became an FM radio staple and drew the ears of guitar aficionados like Pete Townshend—who personally invited Joe and the James Gang to join the Who on tour. Townshend regarded Joe as “a fluid and intelligent player” with few peers. Soon the American public caught up in a big way, as the James Gang scored hits with singles like “Funk #49” and “Walk Away” and gold certifications for the albums James Gang Rides Again (1970) and Thirds (1971) before Joe’s departure following the landmark 1971 live album, Live in Concert, recorded at New York City’s Carnegie Hall, which the James Gang were the 1st rock band ever to play. Despite the band’s upward trajectory, Joe found himself at a creative crossroads: the music he was hearing in his head no longer fit the trio format. He impulsively walked away from a band with consecutive gold albums and moved from Cleveland to a former mining village high in the Colorado Rockies to pursue an as-yet-undefined sound with a new set of collaborators. In typical Joe Walsh style, he found out about a new studio being built nearby and arranged to record there for next to nothing in exchange for working out the kinks in the untested room. The album became the much-loved self-titled 1972 debut by Joe’s next band, Barnstorm, and the studio became the legendary Caribou Ranch, soon to be home to hit recordings by Elton John, Chicago, and Earth Wind & Fire, among many others. Barnstorm’s second album, 1973’s The Smoker You Drink, the Player You Get, yielded the biggest hit of Joe’s career to that point, with “Rocky Mountain Way” eclipsing his James Gang output. Once again, however, despite another band on the rise, Joe was gradually getting restless. He found a new sense of home—and a new manager, Irving Azoff—in the musical melting pot of Los Angeles, where Joe formed bonds with Glenn Frey, Don Henley, Jackson Brown, Dan Fogelberg, and J. D. Souther, among others. The 1974 solo album So What emerged from this period, and both that album and the solo live album that followed, You Can’t Argue with a Sick Mind, hit the charts, making Joe a bona fide solo sensation. Even so, when Eagles asked Joe to join, he jumped at the chance. He and the members of the band had already been jamming and writing together as part of the magically fertile LA scene, and now he was able to bring his rock edge to the vocal harmonies he loved so much in Eagles. The result was lightning in a bottle, and the new lineup of Eagles defined an entire era with Hotel California. The album took the already-successful band to dazzling new heights: Hotel California went on to sell over 50 million copies and the title track won the band a Grammy for Record of the Year. Joe’s presence also transformed the band as a concert experience, adding his harder-edged solo songs to the live repertoire. As the recording of Eagles’ follow-up album dragged on, Joe recorded and released a solo album, 1978’s But Seriously Folks…, which spawned his signature send-up of the rock and roll lifestyle, “Life’s Been Good.” During the same period he recorded “In the City” for the soundtrack of the film “The Warriors.” That track was also re-recorded for Eagles album that finally emerged in late 1979, The Long Run. Despite the success of The Long Run, which included three top ten hits and won the band another Grammy, the extremes of being the biggest band in the land took its toll: Eagles ground to a halt in 1980 and eventually confirmed they had split up. It wasn’t long before Joe recorded another solo album, 1981’s There Goes the Neighborhood, featuring perennial fan favorite “Life of Illusion.” Even as Joe spent the next decade battling increased problems with drugs and alcohol, one thing remained constant: his desire to make and perform music. You Bought It – You Name It came out in 1983; The Confessor in 1985; Got Any Gum? in 1987; Ordinary Average Guy in 1991; and Songs for a Dying Planet in 1992. Those years also saw him join Ringo Starr’s inaugural All-Starr Band alongside members of both the Band and the E Street Band, among others; he also toured extensively with Australian supergroup the Party Boys. In addition, Joe played on records by everyone from the Beach Boys, Bob Seger, and Steve Winwood to Michael McDonald, Warren Zevon, and Lionel Richie and produced a New Zealand band called the Herbs. In 1994, Hell Freezes Over, and Joe teamed up again with Don, Glen and Timothy to reform Eagles. Pent-up demand for the band led to ten years of record- breaking tours. And when in 2007 they recorded a new studio album, Long Road Out of Eden, it reached a staggering six-time platinum status long after the industry had pronounced the album form dead. In 1998 Joe was inducted into the Rock and Roll Hall of Fame together with the band. The reformation of Eagles coincided with a new musical beginning for Joe, who was now clean and sober since 1995, leading to one of the most fertile periods of his career. In addition to all the activity with Eagles, Joe embarked on a James Gang reunion (originally at the behest of then-President Bill Clinton). In 2001 Walsh received an Honorary Doctorate from Kent State University. In 2012, Walsh released a solo album, Analog Man, that resonated with fans and concert audiences, and found himself in high demand as a collaborator, producer, and guest musician. Among the highlights: he played alongside Paul McCartney and Bruce Springsteen in the closing jam at the 2012 Grammy awards and that same year the Berklee School of Music gave each of Eagles Honorary Doctors of Music degrees; he took part in the 2014 CBS TV special commemorating the 60th anniversary of the Beatles first appearance on US television; and he appeared on the Foo Fighters 2014 Sonic Highways album and the corresponding TV episode documenting its creation. In 2014 Walsh played select solo shows as well as with Eagles on The History of the Eagles World Tour, named after their Emmy award winning two part documentary, and the tour continued through July of 2015. In Fall 2015 Joe launched his solo Walsh Toor 2015. On October 4, 2015 Joe performed at the UNITE to Face Addiction rally in Washington DC, which he was honored to do having been sober himself since 1995. Joe headlined the show alongside friends including Steven Tyler, Sheryl Crow and Jason Isbell. 2016 saw Walsh back out on the road, with a summer co-headline arena tour with Bad Company, as well as solo Walsh Toor dates. In August 2016 Citizen Soldier was released - a documentary about an Oklahoma National Guard deployed to Afghanistan - to which Joe proudly wrote original music, always eager to contribute to helping Vets and bring awareness to their cause. On September 28 Walsh performed with Vince Gill, James Taylor, Chris Stapleton and Kacey Musgraves for All For The Hall. October saw Walsh as Grand Marshall for the NASCAR “Citizen Soldier 400” race at Dover Downs. On December 4th Walsh become a Kennedy Center Honor recipient as a member of Eagles, which was presented by Ringo Starr. Closing out the year, Walsh was honored for his solo career by MoPop, who on December 8th gave Walsh “The Founders Award”, also presented by Ringo Starr and Paul Allen. The event included a tribute concert celebrating Walsh’s musical legacy by Dave Grohl and Taylor Hawkins, Paul Rodgers, Todd Rundgren, Robert Randolph and Kenny Wayne Shepherd. In 2017 Walsh launched VetsAid, his 501c3 non profit organization, with a first annual concert event on September 20th at the Eaglebank Arena in Fairfax, Virginia. A Gold Star family member himself, Walsh always has supported Veterans issues and was eager to establish his own charity so he could do even more. He was joined in concert by friends Keith Urban, Zac Brown Band and Gary Clark Jr.
Walsh had kicked off 2017 with a 6 show residency series at the House of Blues in Las Vegas, continuing to tour throughout the year as a solo artist and then returned to the House of Blues in November 2017 for additional dates. The summer saw Walsh reunite with fellow Eagles Don Henley and Timothy B Schmidt, accompanied by Deacon Frey and Vince Gil, for the Classic West and Classic East concert events. This led to additional concerts dates, and Eagles are presently breaking stadium and arena records, their touring has no end in sight.